Yesterday, I switched the wallpaper on my computer. It shows lighthouses now. I didn’t know a computer desktop wallpaper could be prophetic, but this morning, while praying, God showed me something, and when I looked up, I saw the lighthouse on the screen. I am fully convinced that we as a Church are running out of time to get things right. We haven’t reached the end yet, but it’s nearer than ever. We Christians in America have put ourselves in a place where we are like toddlers splashing in the water’s edge at the beach. Oh, look! A starfish. Oh, over there! A sand dollar. The water is warm. Mom waves to us. Look how clear the sky is. The water comes up to our knees. That’s how we may think of shallow water. But while that may be a comforting place for the small, it’s disastrous for anything larger—like the American Church. I didn’t set out to think about lighthouses. It was only after prayer that the lighthouse made sense. The Bible says that “deep calls to deep.” Out in the deep is where the unknown lurks. The deep is off limits to anyone but the experienced. The line of transition from the toddler splashing in the shallows to the salt-encrusted face of the grizzled sea captain extends from the shore to that great emptiness that stretches from horizon to horizon, where the land goes missing, and all points of reference vanish. 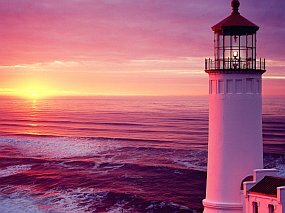 We use the lighthouse as a symbol of Christ guiding us home, but that’s a mistake. The lighthouse exists to warns of the shallows, to force us to head out to deeper water. The real danger is not in the great emptiness out at sea, it’s from being dashed to pieces in the shallows when the conditions turn against us. As a Body of Christian Believers, the American Church needs to steer away from the shallows. We’ve been in them for far too long. We see them as safety, but that’s where the rocks are, and when the surf rises, and the winds along with them, the shallows are the most dangerous place to be. God wants us deeper. We have to move away from our natural home on land. We must familiarize ourselves with the denizens of the deep in their natural environment and know their sonorous callings. We must become comfortable navigating by the stars and their dim, often difficult to read, guidance. We must see the lighthouse not as an inviting light, but as a warning to drive us to the real place of safety, even if that place doesn’t look safe on the surface. Church, we must move out of the shallows. We must learn to navigate the ocean and its depths. We must know how to be at peace, even when no land is in sight. The times demand it.